Everyone worships something; if I take the definition of worship as to revere, respect or stand in awe of someone or something. To bow down in adoration to something. Then everyone worships. You and I revere either God or something else. The God of the Bible, Yahweh commanded people to worship only him because only he is God. Israel struggled being devoted only to God and became very idolatrous. Idolatry is to worship a something, an object as a god. Anything has the potential of becoming an idol in our lives, if we worship or incline to it as we would God our Creator. “Idolatry is the tree from which our sins and struggles grow.” Kyle Idleman: gods at war. Idolatry was a huge temptation to the nation of Israel, and it is a huge temptation to us also. Each kingdom has its own kings, some were good, but some were bad. The good kings led the people toward the Lord and did things according to God’s standard. The bad kings allowed idolatry to infiltrate the nation. I would like to introduce to you the 13th king of the nation of Judah, Hezekiah. He is known as a good king and the text tells us why. Isaiah and Micah prophesied during his reign. Hezekiah did the right thing before God by removing the places of idolatry. Anything can become an idol in our lives. The bronze snake Moses lifted during the wilderness wandering, which God used to save the Israelites from dying due to the poisonous snakes. It was God’s solution to their problem. The people carried this with them through their wandering in the dessert, they had it in the promised land, through the monarchy; until a king of Judah named Hezekiah destroyed it. Do you see the danger with idolatry? When People focus on a thing God may have used to save them rather than the Savior. When people focus on the creation rather than the creator. (They were worshiping the snake on a pole). Which was God’s provision for them during the wilderness; God never intended for them to worship his provisions, but the one who provides.Sometimes, good things, and good people can become idols in our life, and we must not let that happen. For example: How many people worship the cross, rather than the one who died on the cross. – In church we idolize the building, the pews or windows, the pastor, the ministry, traditions, etc. These are things used by God for a time and purpose; but they have no power. When you lament over something you used to do or had, a ministry you used to be involved in. You have let that ministry or thing become an idol in your life. When you don’t want to let go of certain traditions, you are treating them as idols. Nehushtan should be a powerful reminder to us all that even good things—and good people—can become idols in our lives. Our praise, worship, and adoration are to be directed to God alone. Nothing else, regardless of its amazing history, is worthy of worship. Hezekiah was a great king because he got rid of idolatry during his kingdom. He removed the places where people would go to worship idols and he destroyed the things people used to worship. The Bible tells us that he trusted the LORD and there was no one like him among the kings of Judah. (v.5-6) He held fast to the Lord and did not cease to follow him; he kept the commands the Lord had given to Moses. God commands us to only worship him and nothing or no one else. He alone deserves our adoration. What is it that is competing in your heart with God? Whatever God has given you, be grateful, but don’t worship it. Worship the one who gave you what you have. 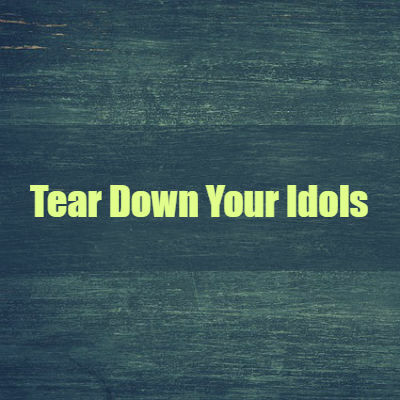 Tear down your idols if you want to please God.